- Connection: flexible connection hoses G⅜"
GROHE EcoJoy®- Water-saving technology that also saves you money. GROHE QuickFix Plus®- For easy shower rail installation. GROHE SilkMove®cartridge - Smooth control comes from superior cartridge technology. GROHE StarLight®- High shine chrome coating makes cleaning easy. 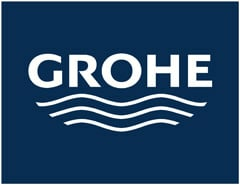 A German engineered designer tap at an amazing price – by GROHE! 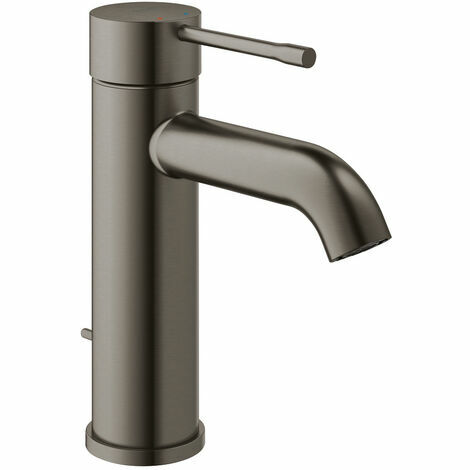 With its slim cylindrical body, distinctive curved spout and in Brushed Hard Graphite, the GROHE Essence Single-lever basin mixer with pop-up waste looks perfect in any cool and contemporary bathroom or cloakroom. Packed with GROHE technology, it is a delight to operate. The control of water is precise and effortless thanks to the GROHE SilkMove ceramic cartridge and GROHE EcoJoy technology limits water flow to 5.7 l/m – saving water and money. You can even set the angle of the AquaGuide aerator to suit the contours of your basin to avoid spills and splashes. And a simple one-hole installation using the GROHE QuickFix Plus system cuts fitting time by up to 50%! One of our most popular basin mixers, it complements other products in the GROHE Essence range in Brushed Hard Graphite such as the GROHE Essence Single-lever bath filler.